A new study examining the effects of wearable digital intervention to improve socialization in children with autism spectrum disorder (ASD) has found promising results. In a randomized clinical trial involving 71 children with confirmed ASD, investigators found that use of Superpower Glass (SG), deployed using Google Glass, 4 times per week over the course of 6 weeks resulted in an average gain of 4.58 points (p=.005) on the Vineland Adaptive Behaviors Scale socialization subscale when compared to the control group. According to authors, this study represented the first randomized clinical trial with an intention-to-treat analysis to determine the efficacy of wearable digital intervention to improve social behavior of children with ASD. The study included 71 children with confirmed ASD, the majority of which (89%) were boys and the group had a mean age of 8.38 years (SD=2.46). To be eligible for the study, children had to be between 6 and 12 years of age, within driving distance to Stanford University, receiving applied behavior analysis (ABA) therapy at least twice a week at home, and must have attained a score greater than 15 on the Social Communication Questionnaire. Of the 71 children, 40 were randomized to treatment and 31 were randomized to control. Children randomized to treatment were found to have an average gain of 4.58 points when tested on the Vineland Adaptive Behaviors Scale socialization subscale after 6 weeks. Four socialization measures were assessed using an intention-to-treat analysis with a Bonferroni test correction. Primary treatment effects were also found for the other 3 primary measures but not a significance threshold of p=.0125. Investigators designed SG as a wearable social learning aid for children with ASD to encourage facial engagement and provide feedback to the child during social interactions at home. A home computer vision system runs on Google Glass that wirelessly connects to a smartphone app and provides the intervention to the child wearing the glasses. The device has two cues for the child’s social partner. The first cue is a green indicator box that illuminates the smart glasses unit’s peripheral monitor when a face is detected within the outward-facing camera’s field of view. 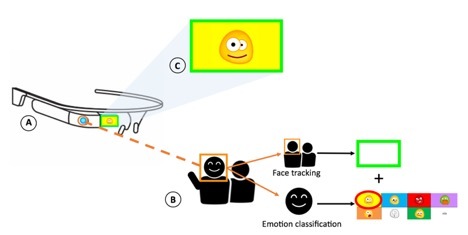 The second is an emoticon that appears in the display and a robotic voice audio cue, which families could disable, is played through the bone-conducting speaker of the glasses when a face is classified as 1 of 8 emotions. Investigators had confirmed the feasibility of fit and its augmented reality form factors in an in-laboratory feasibility test and in a field test of home usage by children with ASD. These studies supported their hypothesis that children aged 4 to 17 years can comfortably wear the glasses and process the video and audio cues provided through the smart glasses unit. Authors identified several limitations within the study, including the post-study empirical variance suggesting that the study may be underpowered by a factor of 2. Other limitations were low participant adherence to recommended treatment dosing, the restricted recruitment of individuals to within driving distance of Stanford University, and investigators they were unable to perform direct comparison tests for sustained gains because control patients did not have a second posttest before crossing over to treatment. Dennis Paul Wall, PhD, associate professor of pediatrics and psychiatry at Stanford University and one of the study authors, told MD Magazine® the results of the study showed promise that wearable technology could one day be an effective means of treating ASD. “We certainly think that there is great purpose and potential to be used while children are waiting for access to the current standards of therapy that are administered today. We hope to do a study on younger children who are waiting for care and have a lower baseline levels of emotion recognition and social acuity,” Wall explained. The study, “Effect of Wearable Digital Intervention for Improving Socialization in Children With Autism Spectrum Disorder,” was published in the Journal of the American Medical Association.